The ultimate parent company of the Group is Alliance Global Group Inc. (AGI) with office address at 7th Floor, 1880 Eastwood Avenue, Eastwood City CyberPark, 188 E. Rodriguez, Jr. Avenue, Bagumbayan Quezon City. On December 22, 2010, the Alliance Global Group, Inc. entered in to a Subscription Agreement with the parent Company to invest and acquire controlling interest in the latter. The agreement initiated an application by the parent Company with Securities and Exchange Commission (SEC) for an increase in authorized capital stock from Php5 billion to Php10 billion. On January 20, 2011, the SEC approved the parent Company‟s application for increase in capital stock. in Eight Sto Domingo Place in Quezon City, residential lots in Magnificat Exec. Village in Lipa Batangas, Monte Cielo De Naga in Naga City, Sta. Barbara Heights in Ilo-Ilo City and sale of commercial lots in Carmona Cavite. Income from rentals and golf course maintenance contracts amounted to P 45.2 million. Balance of revenues were contributed by equity in net earnings of associates and other income of P 75.2 million. The company posted a P44.1 million Net Income for the three-month period ended March 31, 2011, as compared to a P11.23 million net income realized as of March 31, 2010, mainly due to increase in real estate sales and other services. As a result, Earnings per share increased to P 0.0055 from the previous year‟s level of P 0.0028. THE LEISURE property arm of conglomerate Alliance Global Group, Inc., will spend P20 billion for two long-term, master-planned tourism complexes in Boracay and Cavite, an official said on Thursday. "Global-Estates Resorts, Inc. with other Alliance Global subsidiaries, will invest P20 billion in integrated tourism estate projects," Alain Sebastian, assistant vice-president of Global-Estates, said in a note to stockholders. The 140-hectare Boracay Newcoast, a partnership with the family of businessman George T. Yang, will be backed with a P15-billion investment. Mr. Sebastian said it will 1,500 international-grade rooms that will be managed by three international hotel brands and one local hotel brand. Furthermore, Global-Estates will spend P5 billion for the 1,149-hectare Twin Lakes Resorts in Tagaytay, Cavite, Mr. Sebastian said. ahmmm... tanong po mga bosing, ang GERI ba ang may hawak ng isa sa pinaka malaking land area sa Boracay? May nabasa kasi ako non but I forgot if ito nga yun. Seems like the government is very keen on the development of our tourism industry recently, so I'm thinking if this would be a good stock to buy "fundamentally". @Luc23 - Para sa akin, sang-ayon ako sa paniniwala ni Andrew Tan na tourism ang magiging "sunshine" industry ng Pilipinas sa hinaharap. Sa ASEAN at BRIC countries pa lang, panalong-panalo na tayo kung market lang ang pag-uusapan. The challenge right now is to create the necessary infrastructure and the implementation of favorable government policies. It will required a concerted effort by both the private and public sector if we are to have a sustainable tourist industry. If we are to objectively assess GERI's potential, consider what Andrew Tan has achieved up to this point. My two cents: accumulate GERI if you have the long term in mind. PD: I rode the LND/GERI train from the .70 centavo level and sold all at the 1.80 level. No GERI at the moment. 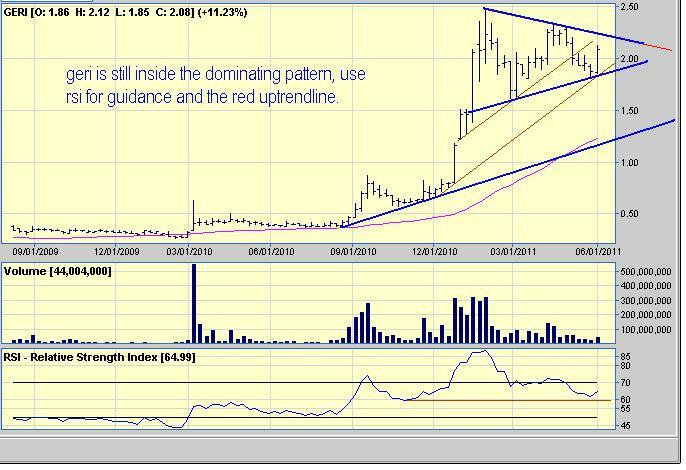 The bad sign is sharky siya pero the good sign as long as the MA's are pointing upward I'm still bullish and will just ride on my profit the longer and ignore the few bumps. Also a good sign - low volume at the 161.8% PRZ. look who's buying? another good sign? Today's price action was a signal to buy. But for those who want more proof from Mr. Market, this guy needs to show some conviction and not drop below 2.50 tomorrow. still holding? anong alam ni McCoy na di natin alam?